Writer, folklorist, photographer and filmmaker Alan Govenar has created a loving tribute to indigenous singers Osceola Mays and John Burrus in the musical play, Texas in Paris. 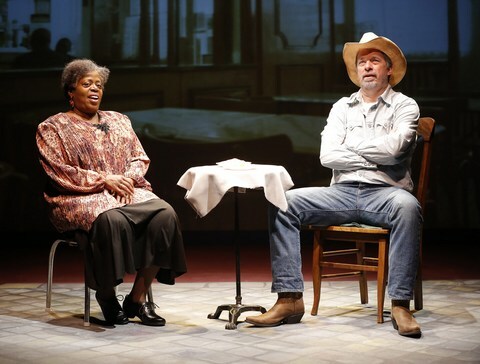 Under the direction of Akin Babatundé with whom Govenar created Blind Lemon Blues in 2009, this low-key show, based on true events, which includes 26 spirituals, cowboy songs and country hymns recounts how these two Texans, one black, one white, who would never have met at home, were sent to Paris in 1989 as part of a festival to introduce the French to “roots music.” While Texas in Paris is a concert, it is also a subtle investigation into American race relations as Osceola tactfully makes John aware of the prejudices he has held all his life. Although Osceola and John think they have nothing in common when they meet at the airport, they have shared many of the same experiences. Both were the children of sharecroppers, both have never sung professionally before, both have never known members of the other race except in work situations, both are thankful for the money the 17 Paris shows will bring them, and both are people of deep faith. Both have worked for hire: Osceola has been a domestic servant, while John has been a cowboy breaking horses. However, in other ways they are opposites: Osceola is very talkative and warm, while John is gruff and taciturn. She has never been out of the country or flown on a plane, while John was in Paris before when he was in the U.S Army during W.W. II. She is a widow of one year and it is his wife who arranged for him to make this trip. Osceola immediately takes to Paris where she feels she is treated differently, as an equal, and racism does not rear its ugly head at every turn. John, on the other hand, does not like the food or the sauces, and is uncomfortable in a place where he doesn’t know the language. Worst still as he tells Osceola when he first meets her, he has hardly ever spoken to black people before and feels uncomfortable around them, having been brought up to believe that the races should remain with their own kind. While she is given the bigger reception on stage, he is embarrassed that he is not being received as well. Texas in Paris is most memorable as a study in how two very different people from opposite worlds eventually become friends. In the course of the play and their time together, Osceola goes out of her way to change John’s inherent racism and close the distance between them. Both the songs and Osceola’s poems prove to be a subtle course in countering racism and the distance between people. The 26 musical numbers (with music supervision and research by Amy Jones) include such well-known songs as “Bury Me Not On the Lonesome Prairie,” “All God’s Children Got Shoes,” Nobody Knows the Trouble I See,” “Git Along Little Dogies,” and “When the Saints Come Marching In,” as well as ones that are less well known. While White sings most of her songs a cappella, Wakefield accompanies himself on guitar, banjo and harmonica. In their songs recreating their concerts on the stage of the Maison des Cultures du Monde, they sing their songs separately, until the rousing finale when they have not only reached a rapprochement but join each other in their last song. White and Wakefield make a very dramatic contrast as these two very different people. Like her character of Osceola Mays, White is effusive, ardent and enthusiastic. She throws herself into her songs making them emotional and heartfelt. Wakefield’s John Burrus is reticent and uncommunicative but able to make his equally deep feelings felt. His cowboy songs also have an air of authenticity like White’s spirituals, as well as in the country hymns they alternately sing. They not only command the stage but make us forget that we are not seeing the real Mays and Burrus. James Morgan’s minimalist unit set is enhanced by the projection and sound design of Jason Johnson-Spinos which takes us to various locales in Paris: the hotel, the theater, cafes and restaurants, the metro and the Jardin du Luxembourg. While the actors do not change clothes in Christopher Vergara’s costume design, they have the lived-in look of exactly what these people would wear. Brian Nason’s lighting shifts are understated and elusive enough to represent changes of city locales without drawing attention to the 20 scene changes in the course of the weeks the singers are in Paris. There are also photography, video and location sound recordings by Governor who recorded the original singers in the 1980’s, as well as additional footage by Robert Tullier, Didier Dorant and Katela Doolin. While Alan Govenar’s Texas in Paris is not a musical in the traditional sense, it is definitely a concert in the literal sense. It is also an engrossing and subtle play about race relations and the misunderstandings that separate people. 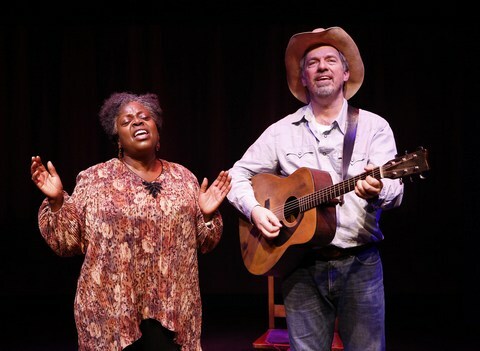 Under the restrained and assured direction by Akin Babatundé, the performances by Lillias White and Scott Wakefield are poignant and authentic.